Modern children play outdoors just half as much as their parents did when they were young, a study has revealed. Today’s youth are more inclined to stay indoors and watch television, play computer games and, in some cases, even do their homework, than go outside to play, according to researchers. Figures show that those growing up in the during the 1970s and 1980s enjoyed more than two hours of outside play each weekday, and a further nine hours at weekends – whatever the weather. But today’s youngsters venture outside for just over an hour each weekday, and fewer than five hours on Saturdays and Sundays. The study of 2,000 parents revealed the average parent spent ten hours and 26 minutes playing outside during the working week when they were children – double the five hours and 32 minutes children head outdoors today. Weekends identified similar results, with youngsters spending just four hours and 32 minutes outside over the two days, compared to the nine hours their parents played outdoors during the same period. It also emerged that 44 per cent of parents wish their children played outdoors more often, with 58 per cent saying their children don’t play outside as much as other youngsters they know. And 54 per cent seriously worry their child doesn’t spend enough time playing outdoors. Instead, 43 per cent say their children would rather watch television than go outside to play with friends, while another 42 per cent prefer to play computer games. Parents also said their children would rather surf the internet and listen to music, with almost one in ten claiming their offspring would even choose to do their homework over venturing out of the house. A third of parents polled said their children will only play outside when it is sunny, with just 17 per cent going outdoors whatever the weather. In comparison, almost one in three parents said they enjoyed the fresh air come wind, rain or shine. 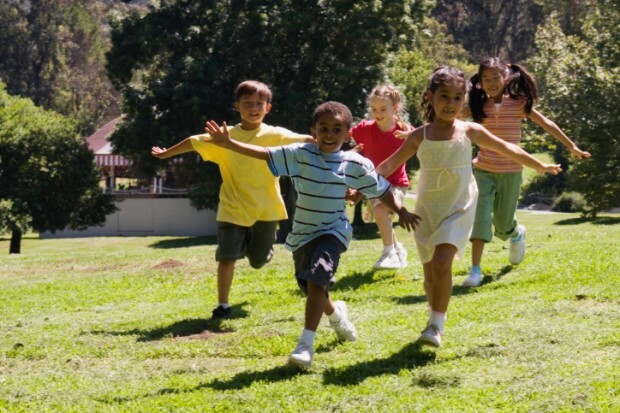 An astounding 43 per cent of parents even admitted they rely on school to ensure their children are getting plenty of time outdoors through PE and play times, and spend very little outdoor time with their children themselves. The statistics emerged in a study by JCB Kids to mark the launch of its ‘Fresh Air Campaign’. Sam Johnson, spokesperson for JCB Kids, said: ‘It is alarming the extent to which today’s children are missing out on the outdoor play time which we enjoyed as children. ‘Playing outdoors is so important for children – not only to help them stay active and healthy, but also to socialise with friends – and create those treasured childhood memories which we look back on so fondly. ‘There are many distractions which divert kids’ attention from going outside, but as parents we need to encourage adventurous spirit and create imaginative, and of course safe, opportunities for them to get out there. Cath Prisk, Director of Play England, a UK wide charitable organisation who promote outdoor play for children and are supporting the JCB Kids Fresh Air Campaign added: ‘It’s a sad reality that many kids don’t get outside to play every day anymore.